Riding in a graceful gondola with a gondolier standing at the helm, and even singing, is somehow inherently more romantic than powering along in a motor boat or an electric Duffy. If you think you have to travel to Italy to experience a romantic gondola ride, you are mistaken. Traditional Venetian gondolas have been plying the waters of Southern California for many years, and their numbers and locations are growing. There are private gondola rides for two or gondolas that will hold up to a dozen. Some provide just a wine and cheese option, while others offer a full meal. All of them are great for a romantic occasion like proposing or celebrating an anniversary and some can even arrange an onboard wedding. Criteria you might look at when choosing which gondola company to arrange your trip include proximity to where you are staying; what you will see on your ride; whether there is more than one route to choose from; what kind of food and beverage services are available, if any; and the availability of singing gondoliers if that interests you. Some can also arrange a photographer to document your whole trip or just a special moment. It's chilly on the water once the sun goes down, even in summer, so bring a jacket. In the winter, it's quite cold after dark, so bundle up and bring a blanket (they give you one, but more is better). Gondola routes and schedules can change due to the tides. When tides are particularly high, the gondolas can't fit under some of the bridges. So, for example, if high tide is at sunset, a sunset gondola ride around Naples Island might not be possible, so an alternate route would be chosen. Gondolas are a popular location for marriage proposals and Valentine's dates in Los Angeles. Gondolas are also a preferred way of seeing some of the area's best waterfront Christmas decorations. Don't forget to tip your hard-working gondolier. Gondola rides around the canals of Naples Island and Alamitos Bay in Long Beach. This is a great experience all year long, but especially during the Christmas season when the houses along the canals are lit with holiday lights. It is one of the most picturesque areas for a gondola ride, with lots of bridges that provide good acoustics for singing gondoliers. Best to BYO wine and picnic, various snack options are available for purchase. Request a singing gondolier if you want one. Staff are happy to help facilitate your dream proposal or special celebration. Gondola Adventures has the most ornate gondolas around. They offer both electric and traditional rowing gondolas. The 2 rowing gondolas, one of which is a traditional wedding gondola, are imported from Venice Italy. The wedding gondola has more intricate décor than your everyday gondola. The 4 electric gondolas are carved mahogany with white canopies. Owner Greg Mohr, president of the Gondola Society of America, can often be found at the oars serenading guests. Most regular guides sing, but check to confirm if it's important to you. Gondola Adventures has a wide variety of gondola cruises to choose from varying in length and food options, including proposal and wedding cruises. If you're thinking of proposing, check out their Message in a Bottle option for an over-the-top romantic gesture. Gondola Company of Newport Beach operates gondolas on Newport Bay and around the canals of Newport. Cruises include a bread and cheese basket and sparkling cider. You can bring your own additional food and wine. Request a singing guide if you want one. Sunset Gondola provides gondola tours around the canals of Huntington Harbor in Sunset Beach, just across the Orange County border. These inland waterways lined with beautiful homes and yachts are a lovely backdrop for singing gondoliers. Meals are not provided on the tour, but chocolate covered strawberries and flowers can be arranged. Gondola Amore offers gondola tours of the coast and marinas in Redondo Beach with a nice view of the cliffs of the Palos Verde Peninsula. They have a dinner tour option and offer various packages including hotel and spa treatments. 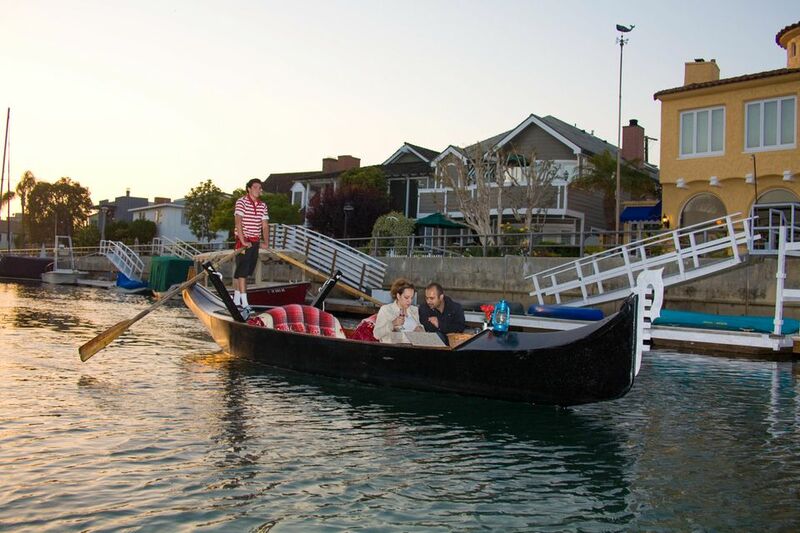 Gondolas D'Amore explores the marina in Marina Del Rey in their canopy-covered gondolas. They offer a dinner option on 2-hour tours, with the standard bread, cheese and salami included on the hour-long tours. BYOB.